The votes are in and party preparations are almost complete. Join us for a spectacular party celebrating your favorite local business. Party starts at 5:30. Show starts at 7. And it’s the Indie Biz party of the year. Come meet the who’s who of local business and newcomers alike. 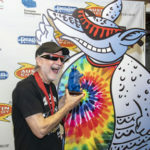 We will announce and honor five finalists in each of seven categories as well as the winner of the Armadillo. • Fabulous local food from your favorite local restaurants. Hoover’s Cooking, Wheatsville Food Co-op, Eldorado Cafe, Amy’s Ice Creams and Tiff’s Treats will be serving! 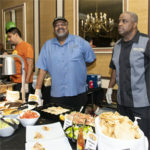 And Hoover’s will be tending bar with their award-winning margaritas and more. • Local Entertainment from Rick “Daddy” McNulty, who will be playing the best of local Austin music at the pre-awards and after party. The Rollergirls are in the house! TXRD (Texas Roller Derby) will rev up the party with a wild ride. World Famous Bob is our dynamic comedic MC!. 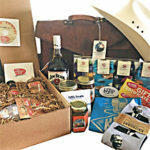 • Local stuff: Be sure to get your raffle tickets for the Dillo Fundraiser Raffle. Five fun collections showcase the best of local business products and services. So far this year we have Tickets to everything, Music Classes, Massages, Stetson Hats, A Boat Cruise, Locally Made Chocolate, Taco Socks, Gift Certificates Galore, T-Shirts, Underwriting on KOOP, Leather Brief Case, Liquor, Ice Cream, A Snowball Party Truck and so much more. 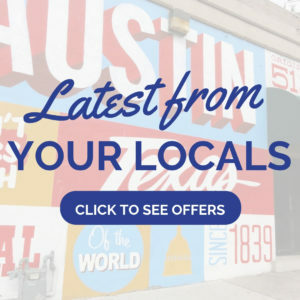 Take a chance on collections of items donated by your favorite local businesses such as Keep Austin Weird, Out & About, A Family Affair-Pets Included Too and others. Your tickets will be ready for you at the awards when you donate to AIBA. The party is free so you’ll have a little extra for tickets. • Armadillo Balloon Hats. Yup, only at the Armadillo awards can you get your very own Blue Dillo Balloon Hat custom made by Bobby Cordell. 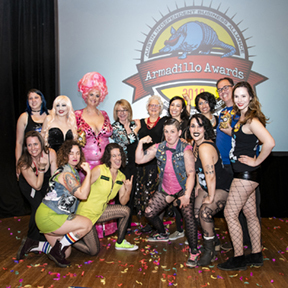 It’s all waiting for you at the Armadillo Awards Party. RSVP now. We’re celebrating National Small Business Week May 6 – 10 with a great slate of exciting options. The City of Austin Small Business Program is excited to announce this year’s National Small Business Week! Join us for five days of free sessions covering funding, marketing, legal, and business planning. See the full line-up and register! Join us for an intimate conversation with one of Austin’s dynamic entrepreneurs, ABC Home and Commercial Services owner and CEO, Bobby Jenkins. Local KVUE news anchor and reporter, Jenni Lee, will open up discussions with Jenkins as he covers the journey of the original ABC Pest Control brand to its expansion as a full-service company with over 800 employees throughout the state. Following the discussion, the 6th Annual City of Austin Business Awards will recognize entrepreneurial excellence in our community. REGISTER NOW. AIBA is participating in National Small Business week as well. In partnership with the Small Business Program, we are presenting Amy’s EDU: The Scoop on Entrepreneurial Secrets on Wednesday, May 8. RSVP Now. The Dillo Fundraiser Raffle is part of the show at the Armadillo Awards Party. Attendees purchase raffle tickets (the fundraising part) and pick the collection or collections they wish to take a chance on. The winning ticket for each collection is drawn onstage between the award category presentations. We welcome all goods and services in the form of certificates, gift cards, and items of all sizes and shapes. With your donated item, your business gets lots of promotion on the website, through social media and at the Armadillo Awards. Contact Dixie Patrick, 512-441-2123. for pick up or delivery arrangements. Donate and bring more customers in your doors while helping AIBA! 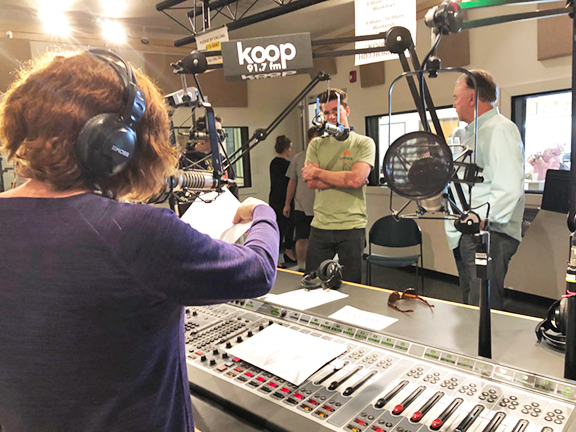 If you’ve been to a recent AIBA event, you may have heard rumors about AIBA possibly having a weekly radio show on KOOP Radio. The rumors are true! We don’t have a show yet (there’s a long process) but AIBA has applied for a show on local business and the community. Did you know that KOOP is the only co-op radio station in the country? With the exception of two paid full-time staff, the station is run by dedicate volunteers. Koop has been an AIBA member for years and we’ve supported one another by trading advertising for underwriting and promoting each other. We’re thrilled and honored to be in the running for a radio show. To have our own show, we have to be programmers which involves lots of training and volunteer time. I’ve been on the road to becoming a programmer since late October. I have been interning with Lisa Scheps on her show, Off Stage and On the Air for five weeks and have five more to go. I’ve completed my station and FCC training and am starting my technical equipment training in a few days. Dixie Patrick, AIBA Membership Manager, is in the training pipeline right behind me. Seed Terranova, IBIZ District Director, will be training in a few months. This will give us great backup and make the show more sustainable. The show will be called The Localist—The heartbeat of Austin’s local business community—and cover Latest From Your Locals, Current Events, Local Stories, Advocacy, IBIZ Districts and Resources. We plan to have two guests per show to weigh in on the show topic. But we’ll also want to tell your stories. Do you have an engaging story about starting or running your business? As we get closer, I’ll be asking for ideas. We’re not there yet. We may not be selected for a show. We won’t be finished with our training until May so watch for updates and soon we’ll be able to say “stay tuned”!